Making plans for a business trip or a vacation can be a time consuming process. With the help of the plane trip checklist, you can make sure that you will have everything you need for your flight and trip as well as leaving your house safe while you are gone. The template will save you lots of time because it is easy to use and you can download it for free right here. The plane trip checklist is fully customizable, so you can make sure the checklist fits your own needs. First, go through the template and remove the items that you will not need to complete. You may not need a pet sitter if you don’t have any pets. Second, add items to your list that you need that are not already included. If you are traveling with your family, you will want to make sure that you have a separate list for each person. Third, add your notes in the column if you have additional information you will need to remember. For example, you can add a note of who you hired to take care of your house while you are gone or where you are putting your passports. First, you can change the template anyway you want to fit your needs. You can remove certain sections or add new ones if you want separate sections for each family member. Second, you can print out the template and cross things off as you complete them. Third, you can color code the checklist so that you know which items are most important, or you can color code the template based on who is going to complete the task. 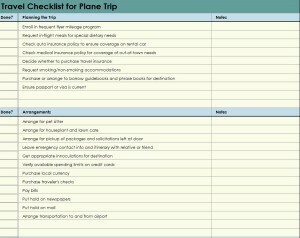 Using the plane trip checklist is a great way to keep everything organized when you are getting ready to go on a trip. It is very easy to forget to pack things, so having the checklist will make sure you have everything that you need.